Apple has obtained the trademark for "i-phone" from a Chinese company that applied for ownership of the name in 2004, and a hands-on with Google's Nexus One phone concludes it isn't an "iPhone killer." Hanwang Technology, a Chinese company that makes e-readers, applied for the trademark for "i-phone" in 2004. The i-phone was a handset the company no longer sells. According to IDG News Service, the new owner of the trademark application has changed to Apple. A Hangwang official reportedly said that the Chinese company reached an agreement with Apple over the trademark to the iPhone name. Details of the agreement were not provided. When China Unicom launched the iPhone last October, it was said the similarity between the i-phone and iPhone names could have made the sale of Apple's handset illegal. Though Apple only sold 5,000 iPhones at launch with China Unicom, sales continued at a steady pace through the end of the year. In early December, it was revealed that Apple had sold 100,000 handsets in the nation of over 1 billion. It is believed that gray market sales far exceed those numbers, however. Engadget got its hands on Google's forthcoming Nexus One handset, which runs the Android mobile operating system and is expected to be available through carrier T-Mobile very soon. The HTC-built device has a 1GHz Snapdragon CPU, a 3.7-inch display, 512MB of ROM and 512MB of RAM. Joshua Topolsky said the phone is a little thinner than the iPhone and feels good in the hand, but aside from its superior design and form factor, it is not significantly different from the Motorola Droid. The improved user interface was also welcomed. "Throughout the phone there are also new animations and flourishes which make Android 2.1 feel way more polished than previous iterations (including the Droid's 2.0.1), though it's still got a ways to go to matching something like the iPhone or even Pre in terms of fit and finish," Topolsky said. "Regardless, it's clear Google has started thinking about not just function but form as well, and that's very good news for Android aficionados." The review was not as favorable as an earlier comparison that said the Nexus One might be more of a "Droid killer" than an "iPhone killer." Google has planned a special event to formally announce the Nexus One Tuesday morning. The GSM-based handset will reportedly be sold direct from Google for $530 unlocked, or $180 under contract with T-Mobile. Anyone know when Apple can put WiFi back in the Chinese iPhone? Are they currently allowed to, but just haven't after making a large batch without it, earlier in the year when the government ban was in effect? I want to see how it'll sell when it gets that back in. There seem to be a lot of people holding out, or buying black market iPhones to compensate. Looks a lot like Windows to me. I thought they could as of 2010. I am still waiting to find out how they disabled it. Removing the OS (driver) and UI features? Removing the antenna and OS/UI features? Using a different chip that doesn?t have WiFi on it seems unlikely since that chip contains other HW features. If it?s just software then an update could add it. Another gawd-danged review of (wait for it) . . . . . . . V-A-P-O-R-W-A-R-E! It doesn't exist until it comes into the hands of teenagers, business people on the move, grandmothers, my wife, and the like. Until then it's nothing more than a promise, an ephemera, a ghost, a wisp, a rumor, a Potemkin Village. That's all. Nothing to see here; move along. Note to Mr. Topolsky: Compare the Nexus One and its OS to the iPhone and OS 4.0, OK? Neither exists yet, so that comparison would be MUCH fairer! Hehe . . . good point. Wonder how much Apple paid? Of course Nexus is not an iPhone killer, it's more like a Pre killer. A Nexus six would do more than kill the iPhone, it would eviscerate it. Do you just troll these forums to get a reaction or do you honestly think you know more than everyone else? For all anyone knows (until its actually released and not just a press junket tool) the 512 RAM may be all that it has in it. That being because if it is a TRUE google phone it will access all its applications from the cloud eventually and there will be no need to have 8,16,32GB of internal storage. i was giving you benefit of the doubt for a while but now its straight to the ignore list. The iPod shuffle doesn't have 512MB RAM, it has a lot less than that. What it does have that is more than 512MB is non-volatile storage. If you don't know what that is, maybe you should look it up. In that case, I will assume I know more than you. I'm not sure why you went off ranting about the google phone etc, after all I was just commenting on a users lack of knowledge, maybe you need some medication to help your anger problem, in any case I hope you get it under control soon. non-volatile storage is that flash memory ?? and why are you 2 dudes fighting on a rumour site . so you lurked 3 yrs and then posted ?? shy huh ?? 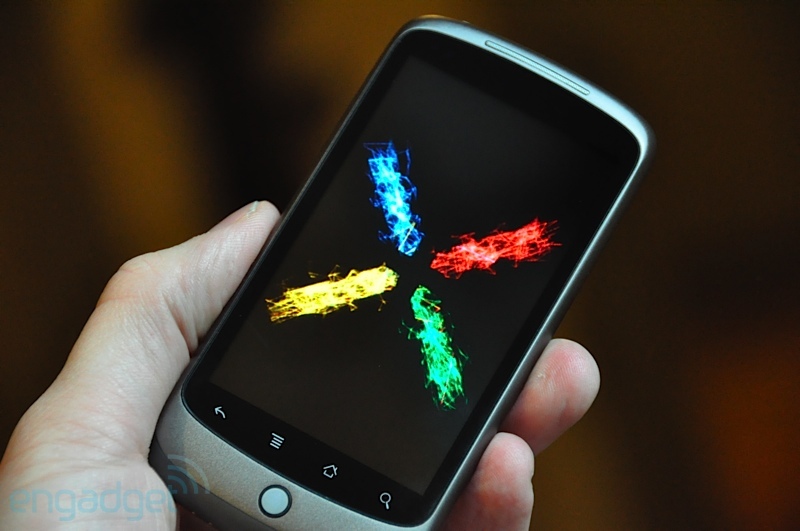 nexus six is the android who dreamed in color of electric sheep in blade runner.. It looks like a good phone and I'd say it's a decent iphone rival - unix OS, nice UI, open development, nice hardware specs. I don't think I'd get one instead of an iphone but very good effort from Google IMO. For it to have a 1GHz processor vs around 600MHz on the 3GS, the smoothness of the 3GS in the video shows how well Apple have optimized their software for the hardware. Apple haters always try to put the iphone down but it's hard to deny that Apple's effort was exceptional when it is always the benchmark others fall short of even with superior hardware specs. yes, and not fighting, just trying to correct something that is making a fool of themselves.